I was born in France into a family where being handy was a necessity and a virtue. From a young age my creative impulse was both innate and encouraged. At 19, after completing one year at the Ecole des Beaux Arts in Nantes I left home to explore the world. After traveling and working various jobs (from nanny to art teacher via cook and clothing designer, to name a few) I completed a B.F.A at Concordia University in Montréal. I have since settled on a career that combines my need to be both creative and useful: making beautiful surroundings to help improve the quality of life of my clients. 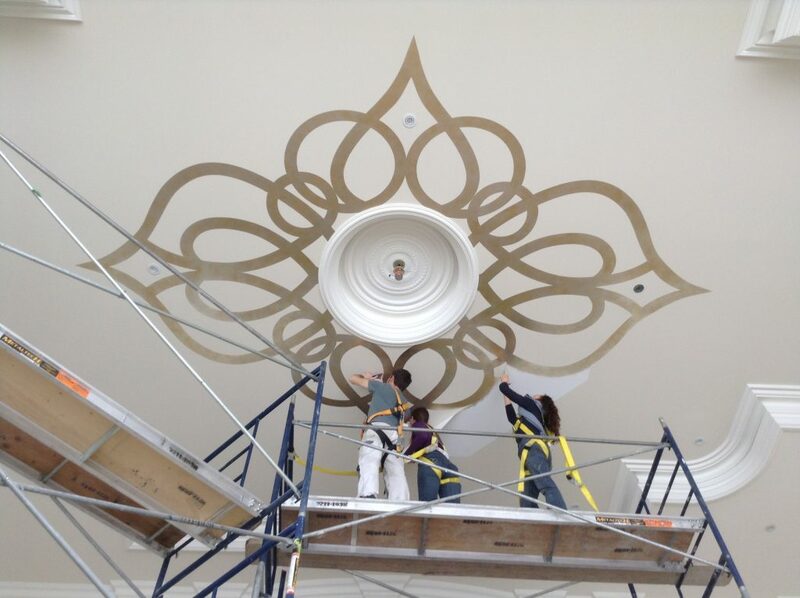 I have worked as a decorative painter since 1997, learning and improving my skills through research, experimentation and formal training in Europe and North America. In collaboration with architects, designers and home owners, I have transformed hundreds of spaces and objects to embellish residences, institutions and businesses. Faux finishing, gilding, mural and trompe-l'œil painting, Venetian stucco, reproduction, restoration, mosaic, fabric painting, glass and mirror painting, verre eglomisé and epoxy art... the possibilities are endless, every project a unique creative challenge. I am always exploring and mastering new techniques to keep my work interesting and my customers satisfied. When necessary I hire seasoned collaborators, adapting the team to the scope of each project. I am a member of the Conseil des Métiers d’Art du Québec and my work has been published in Houzz, Décormag, Montreal Home and Chez Soi magazines. « Nous engageons Marie-Pierre sur tous nos projets artistiques et nous sommes toujours très satisfaits. Les travaux de Marie-Pierre sont impeccables, méticuleux et surtout bien faits! Elle respecte toujours le budget et le délai d’exécution. » Christina Savoy, gérante de projets, Constructions Bélair Nova inc.
"I am very pleased with the work Marie Pierre did in my home. She is an amazing artist. She made all of my dreams become reality in my home. Thank you!" Heather A. "The cabinet and frame painting quality by Marie Pierre was fantastic. "Oh my gosh! That's what you'll say after hiring Marie-Pierre Ayoul. The work she did for me in DDO (Montreal) was out of this world. The day she completed her job, my clients did not stop texting me about the results. They said "Wow, Darleen, she is so talented, we would not hesitate to hire her again". I have to say, she is an artist. I had her paint joint pine and melamine and make it look like marble. You have to see it to believe it. What happened was that I had a design in mind to have marble on a wall and have my trims around the window frame painted a similar colour to the marble veins. In the end I did not like the results and called in Marie-Pierre. She made my trims look like they were pieces of marble, identical to the existing one installed!